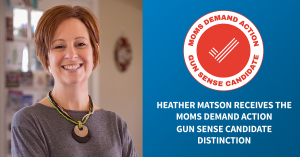 I’m proud to be a Moms Demand Action for Gun Sense in America candidate of distinction! I believe that with all rights come responsibilities, and I know we can work together for common sense public policy. Thanks to Moms Demand Action for recognizing my commitment to gun sense and safety. Paid for by Heather Matson for Iowa House.